BAGHDAD—Since 1994, Native American Heritage has been celebrated throughout the month of November. Soldiers of the 16th Engineer Brigade are proud that one of their own has firsthand knowledge of Native American culture. Sgt. Remi Bald Eagle, raised on the Pine Ridge Reservation in South Dakota, and currently from Westlake, Ohio, has a keen awareness not only of Native American heritage, but of the challenges of growing up between cultures. Bald Eagle was raised by his parents, Chief David Bald Eagle, a Lakota Indian and former regular Army Soldier, and his mother, Josee, a native of Belgium. Bald Eagle’s whole life has been deeply rooted in diversity, beginning with his parents’ chance meeting in Belgium in 1958. Tibbs invited David Bald Eagle to stay with his family for a time. It was there David met Josee, his future wife. When he was well enough, he returned to the United States and performed with the American Wild West Show and Rodeo. Before he left Belgium however, David told Josee that he had a cave in South Dakota waiting for her if she ever wanted to come live with him. “We moved to a house that was built from the ground up,” Remi said. His father’s attempt to shelter him from the racial tensions did not work as well as planned. On the reservation, he was discriminated against for being part Belgian. Off the reservation, he was discriminated against for being Lakota, Remi said. However, the son of Chief David Bald Eagle overcame racial issues with the support of his parents and the education that they provided him. Remi, his brother and father even went on to represent their Native American heritage in various movies and television productions. David was a language consultant for the film “Dances with Wolves,” while Lloyd Bald Eagle, Remi’s brother, had an acting role. “It was a tremendous experience…and was fun to see how movies are made,” he said. “I wanted to go into the military, but I didn’t want to jump ‘feet first’ into the active duty experience,” he said. To “try it out,” Bald Eagle first joined the South Dakota National Guard, enlisting as a bridge crew member. “I joined in 1992, before graduating from Takini High School, as a split-op Soldier in a ‘buddy platoon,’ recruited from the reservations. It was an interesting experience doing my initial training with fellow natives. It really helped the transition,” Remi said. 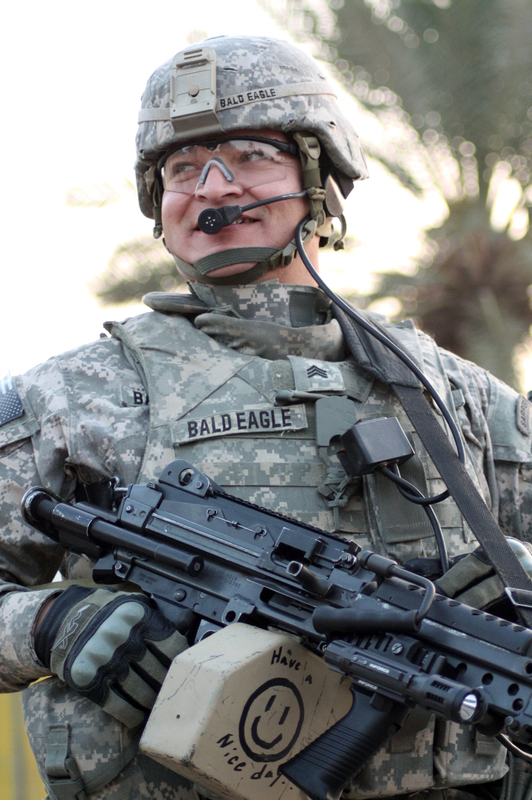 Because he enjoyed his time as a National Guard Soldier, Bald Eagle made the move into active duty military. He changed his military occupational specialty to engineer tracked-vehicle crewman and spent time serving with many storied military units including the 24th Infantry Division and the 2nd Infantry Division. Remi also served in the 577th Engineer Battalion at Ft. Leonard Wood, Mo. His time there helped shape the next few years of his life, including his decision to attend the Army’s elite engineer Sapper school.